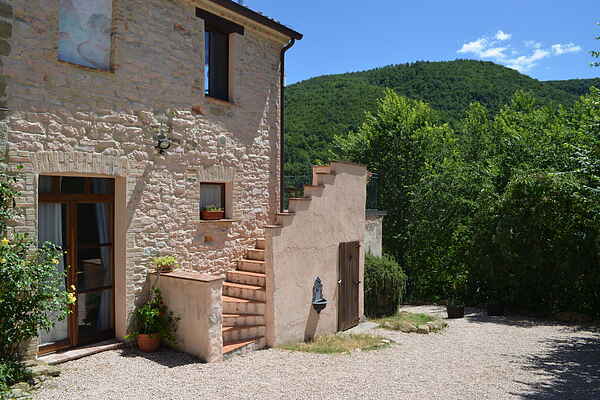 In the middle of Italy, in the beautiful hills of Le Marche, in the province of Pesaro-Urbino and near the picturesque village of Pergola, you can find a beautiful restored farmhouse dating from 1670 that has five stylish apartments, where you are most warmly welcomed in a serene and peaceful environment. This apartment is entirely furnished on the basis of the element water. It is accessible via an outside staircase. First you enter the private terrace, overlooking the beautiful hilly landscape and then by a short staircase you reach the entrance of the apartment. The apartment is suitable for two to four people (the third and fourth person has to pay directly to the owner). In the spacious living room/kitchen there is a double sofa bed for additional guests. Through a corridor and a spiral staircase you reach the bedroom. This apartment will stay cool during summer because of the thick walls. For the cooler days in the low season a wood burning stove is available, so you can enjoy the cosy crackling wood fire with a nice glass of wine from the region. The area offers many possibilities: culture, nature, walking and cycling, but also fun, good food and wine tasting.